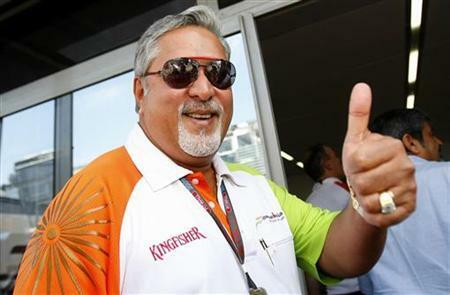 Vijay Mallya, Chairman and Managing Director, Kingfisher Airlines Ltd.
Kingfisher Airlines Ltd (BSE: 532747, NSE: KFA) counter in NSE, on Wednesday, witnessed a major sell of over 36.97 lakh shares by Redect Consultancy Pvt Ltd, which is a Person Acting in Concert (PAC) with the company’s promoter. The deal was disclosed at National Stock Exchange after trading hours on Wednesday. Redect Consultancy raised Rs. 4.19 crore through the offloading, which was at Rs. 11.33 a share. The shares this promoter’s PAC sold off on Wednesday amounts to a 0.55% stake in the company. There were no identifiable buyers, buying above 0.50% Kingfisher shares in NSE. The selling pressure was also evident from the price action which saw the beleaguered airline’s stock touch a new 52-Week Low of Rs. 10.95 during the day, before closing at Rs. 11.05, down by 7.92% from the previous close. StockExplain had earlier twice reported on the peculiar sell-off action by Kingfisher promoter’s PACs, even while numerous investors in the counter who are in deep losses, fervently hope for some supportive action from the promoter group led by businessman Vijay Mallya. At Wednesday’s close price, the stock is down by a significant 37.50% from early April when StockExplain reported these peculiar sells for the second time. On the fundamental side, the pressure on Kingfisher Airlines from most quarters hasn’t eased, with IT Department recently freezing two of its accounts, and leading lender SBI ruling out further advances. Kingfisher is now trying to sell-off its office building in Mumbai, which requires the permission of its lenders. It is also expected to file its financial results for Q4 and FY’12 shortly.